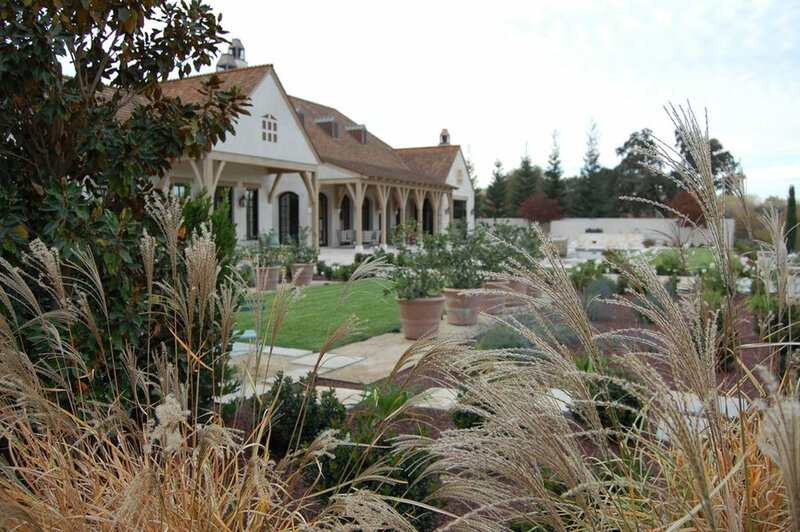 French country residence with central auto court and low plastered walls. 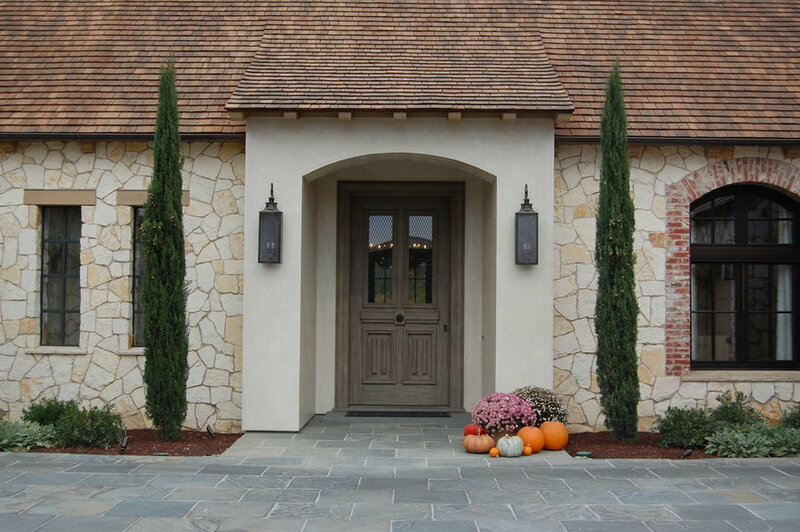 Stone Columns accent the driveway. 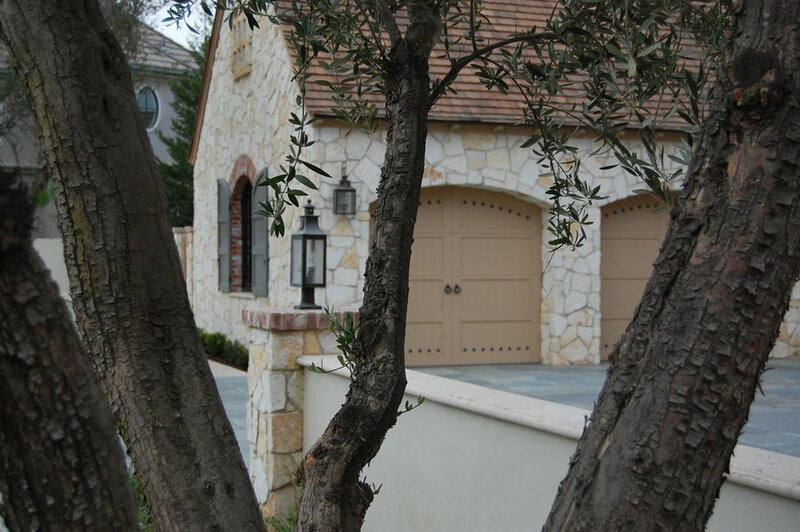 Olive Trees, Boxwood Hedges and Iceburg Roses frame the view of the front of the house. 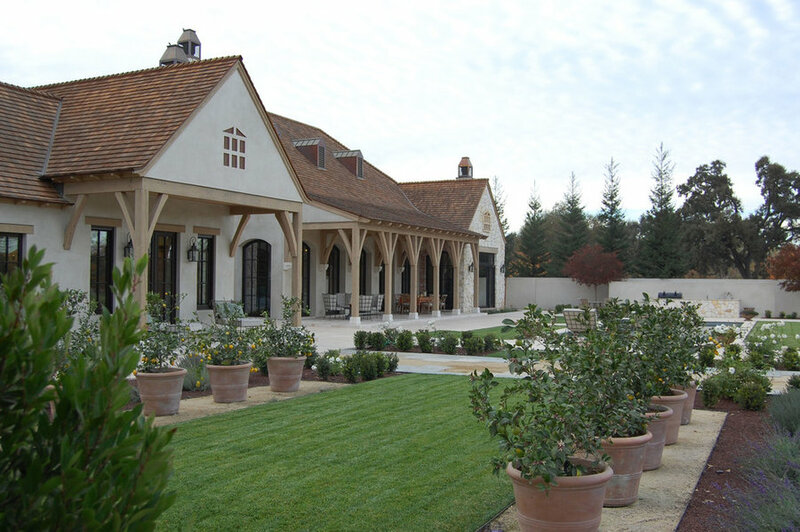 French country residence with central auto court and low plastered walls. 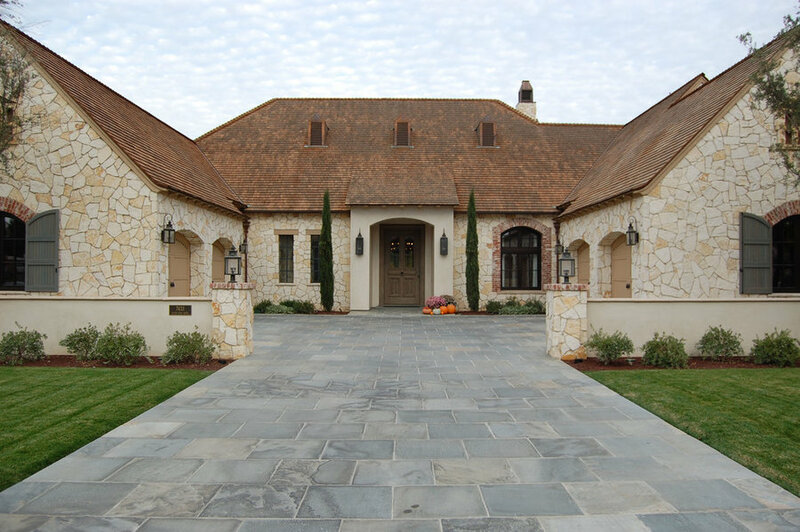 Stone Columns accent the driveway. 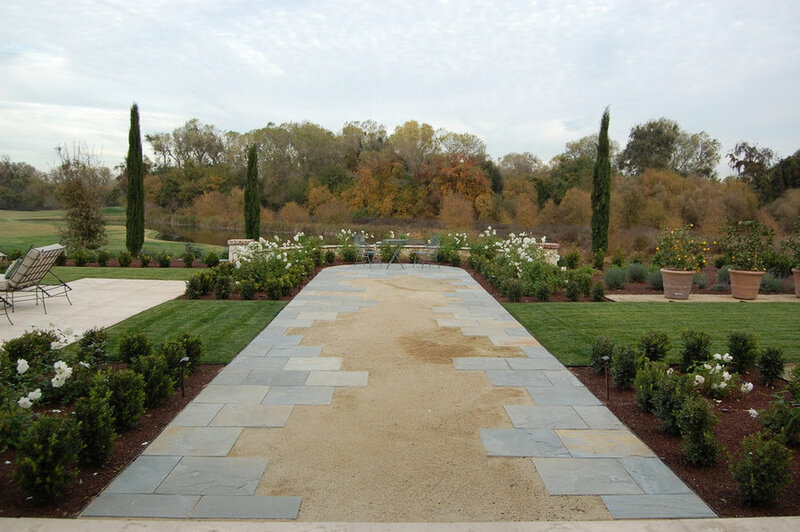 Italian Cypress and low plantings frame the view of the main entry. 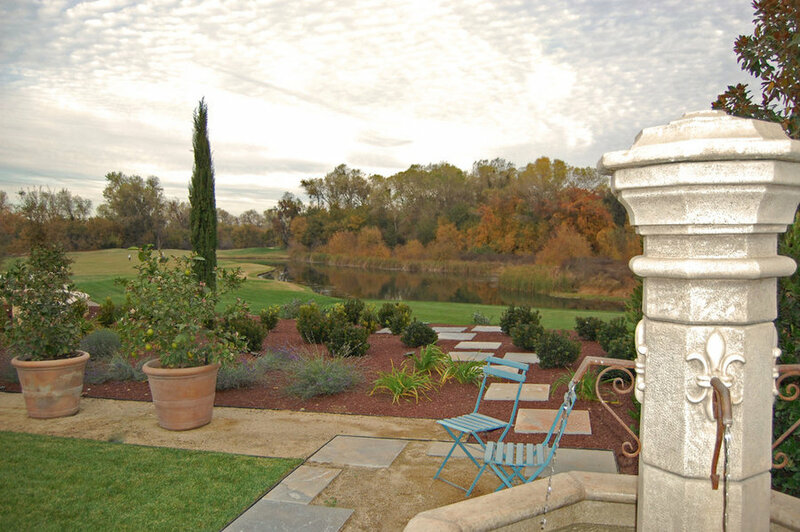 Italian Cypress provide a framed view across the pool and patio towards the golf course and lake beyond. 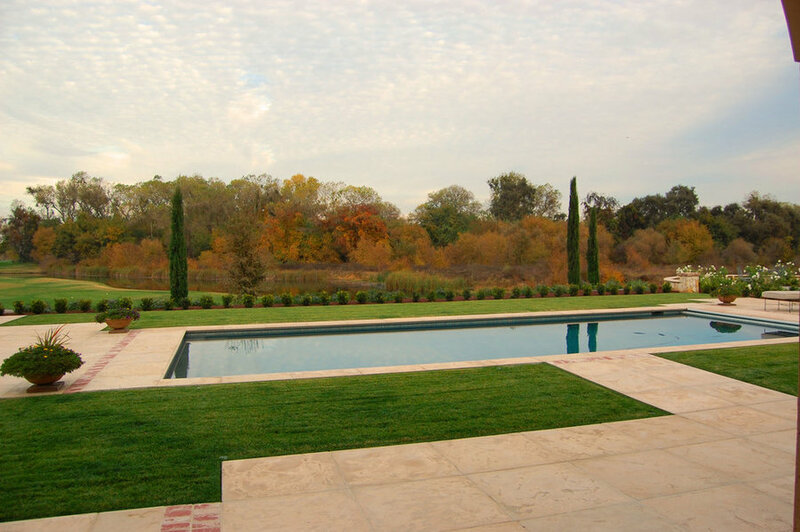 Italian Cypress provide a framed view across the pool and patio towards the golf course. 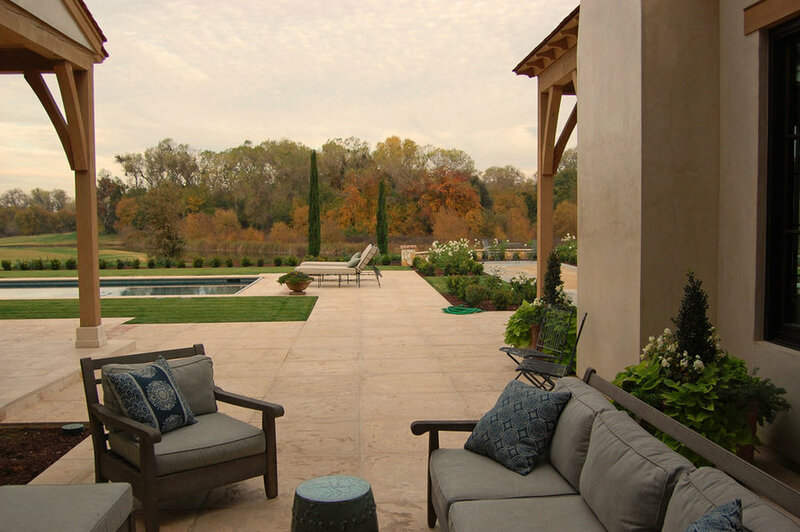 A lounge area sits at one end of the pool while the outdoor kitchen is at the far end. 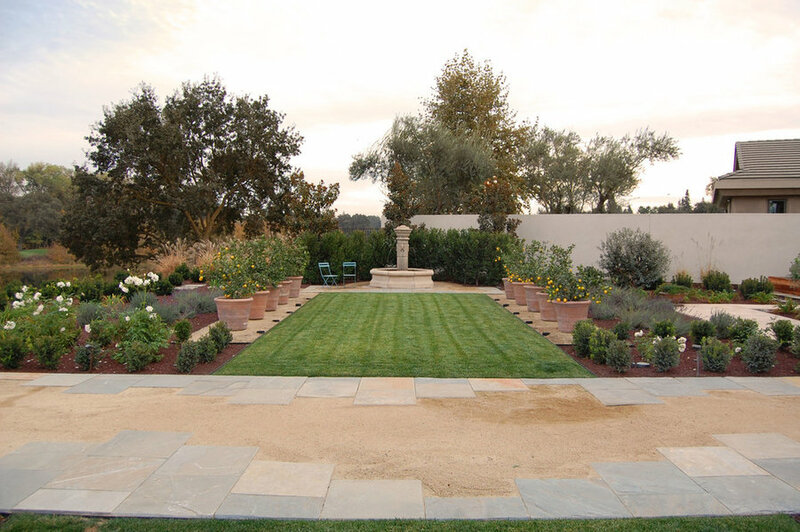 A central axis aligns the pool with a formal lawn area and fountain in the distance. A lounge area sits at the far end of the pool. 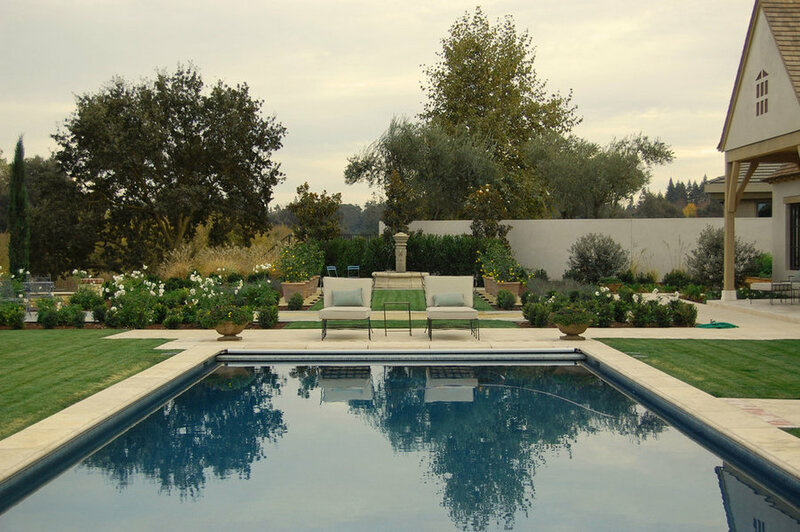 The pool is edged with cast stone coping. 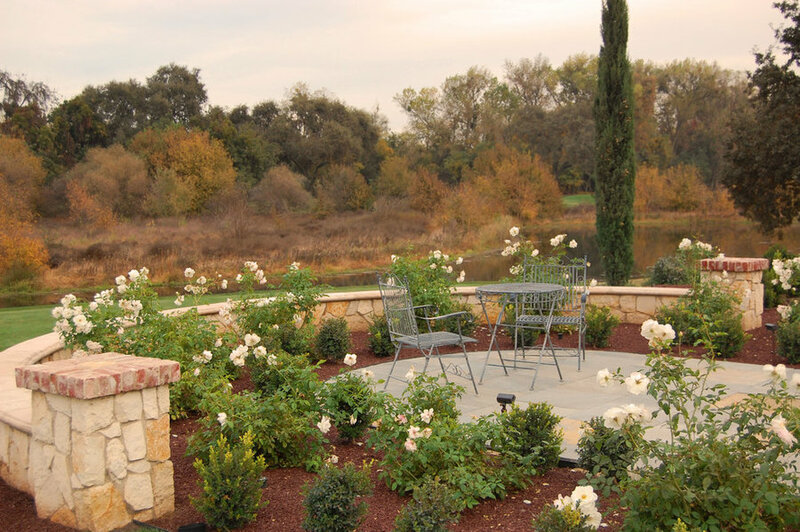 Stone and Decomposed Granite paving lead the eye out to an overlook sitting area. The perimeter white Iceburg Roses frame the view to the golf course beyond. 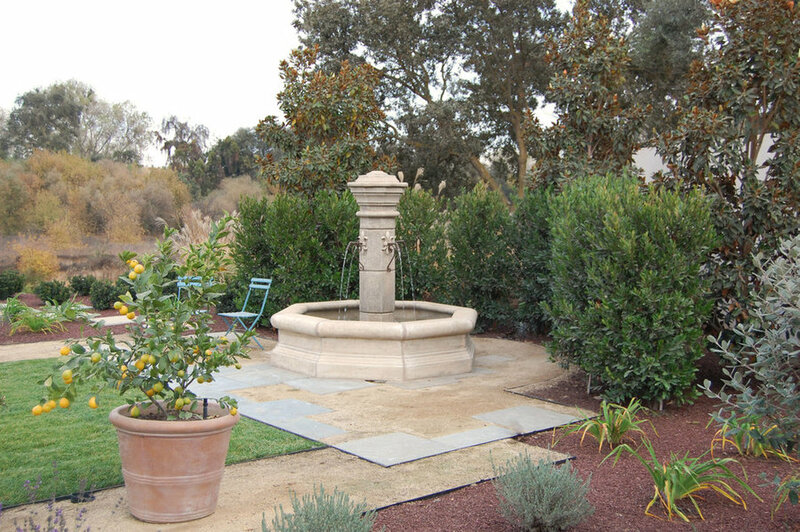 The Covered outdoor sitting area looks out toward the the rose garden and the view beyond. 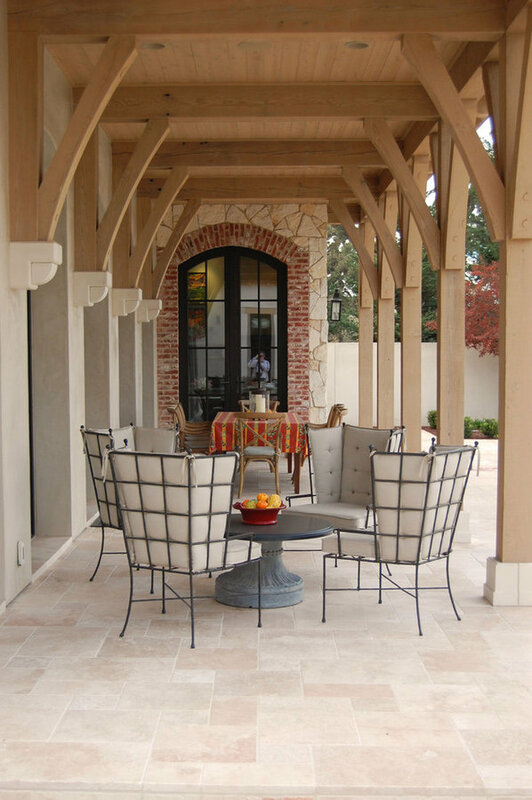 Reclaimed wood posts and beams along with stone paving finish out the space. The covered outdoor dining area looks out toward the the pool and the view beyond. Reclaimed wood posts and beams along with stone paving finish out the space. The covered outdoor dining area and sitting area at the rear of the house. 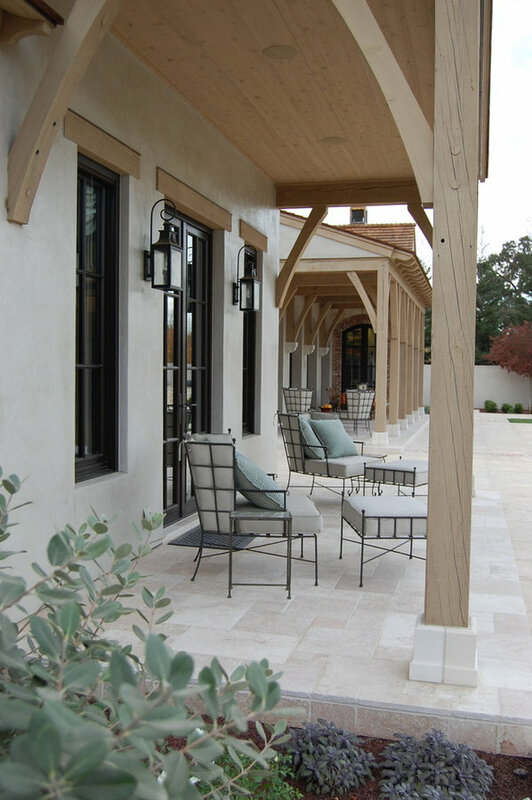 Reclaimed wood posts and beams along with stone paving finish out the space.